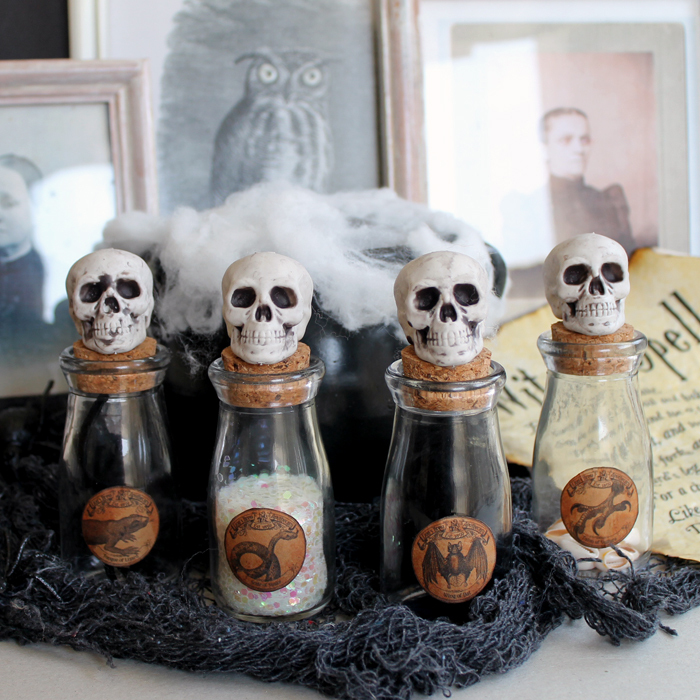 You can make these Halloween potion jars in just a few minutes and add some fright to your home decor. I love adding spooky touches to my home for Halloween. These little jars are going to fit right in. I even have some free printable labels for the fronts so be sure to download those as well. Some links maybe affiliate links which means you do not pay anymore but a portion of your purchase will go to support this site. 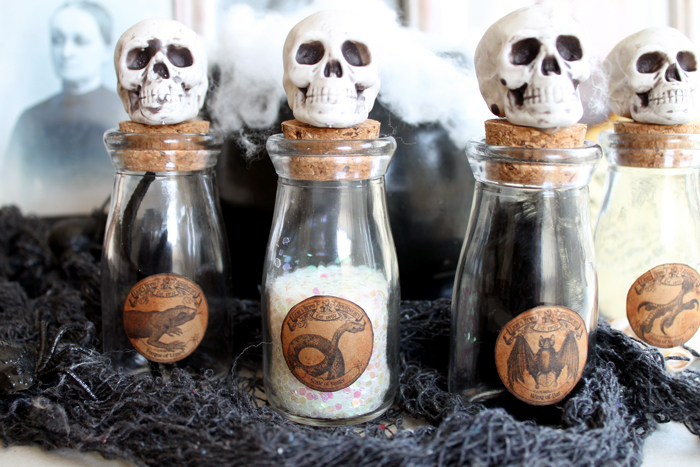 Watch the video below to see just how I make these Halloween potion jars. You will not believe how easy it is! If you can’t watch the video or missed some of the steps, read below for simple step by step instructions. Download the free printable labels here. Print onto a full size sheet of kraft paper labels. Cut around circles that print with your scissors. Distress edges of label with ink. Peel and stick the circle to the front of the mini milk bottles. Add skull to cork top with hot glue. Fill with your choice of filler. Set around your home for a small frightening addition to your home decor. 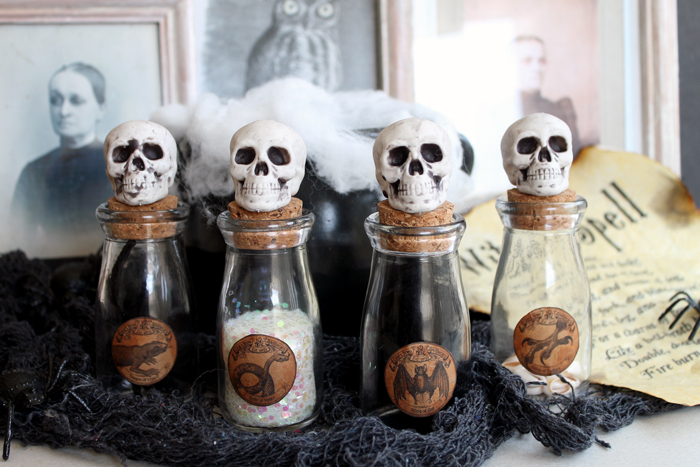 I love these Halloween potion jars! They are perfect with my witch’s spell printable as well. Don’t you just love how spooky they are?? Y’all I cannot wait for Halloween! This is one holiday I can really get into! You can also click here to get that spooky printable art behind the potion jars. 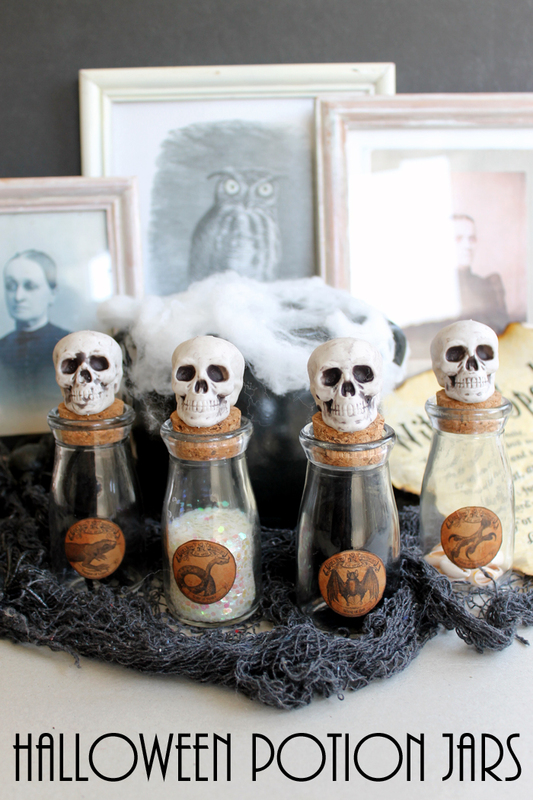 You will have a spooky area of your home in minutes with these Halloween potion jars and other free printables! These Halloween bottles are adorable. Love these! I’d probably fill them with cocktails for a cute party drink or bath salts for a halloween themed bath kit. So cute! These are fantastic! Thank you for sharing your creation! What a great idea. Cute and spooky at the same time. Thanks for sharing your creativity at DI&DI. These are so cute! The mini skulls are like the cherry on top of an ice cream. I hope you’ll share your craft with us this week at The Crafty Corner link party. Have a good day!